It is already a reality: Casa Vicens, the first house designed by Antoni Gaudí, can be visited for the first time, after remaining as a private residence for more than 130 years. It is the last World Heritage building to be opened to the public in the city of Barcelona and will be inaugurated on November 16, 2017. 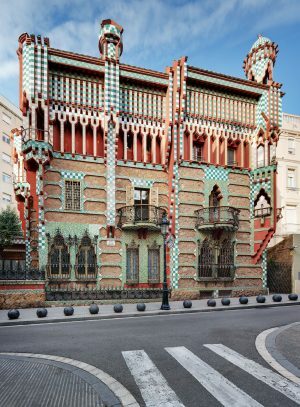 Casa Vicens will complete the list of eight buildings declared by UNESCO of cultural interest for the entire international community, along with the Sagrada Familia, Casa Batlló, La Pedrera, Park Güell, Palau Güell, Palau de la Música and Hospital Sant Pau. The Casa Vicens will propose a cultural visit essential for those interested in knowing the beginnings of Gaudí's architectural work. Built between 1883 and 1885 as an artistic commission for Manuel Vi­cens, Casa Vicens is one of the first masterpieces of Modernism, the anticipation of the later work of Gaudí and a living example of the atmosphere of aesthetic renewal experienced at the end of the 19th century throughout all Europe. At first it was designed as a sum­mer house with a garden, where its geometric patters and rich or­namentation, inspired by the sur­rounding vegetation, are present both outside the house as well as in its different internal spaces. An explosion of colour and creativity materialised in the characteristic ceramic tiles that cover its façade.